As some of you know I lost my Dad a couple of weeks ago and this is another piece of my inheritance, I just got this uncovered and ready to move to my house. I'm still having a hard time with this but it's getting a little better as the days go by. Thanks Dad, rather have you back but I'll take good care of it. Its a 1993 40th Anniversary edition with 33k miles. oh man that's a good looking C4. i got a 427 C2 the same way. and its the same color! keep her shiny and join a vette owners club. be proud of it, that's a damn fine looking vette. Thank you! 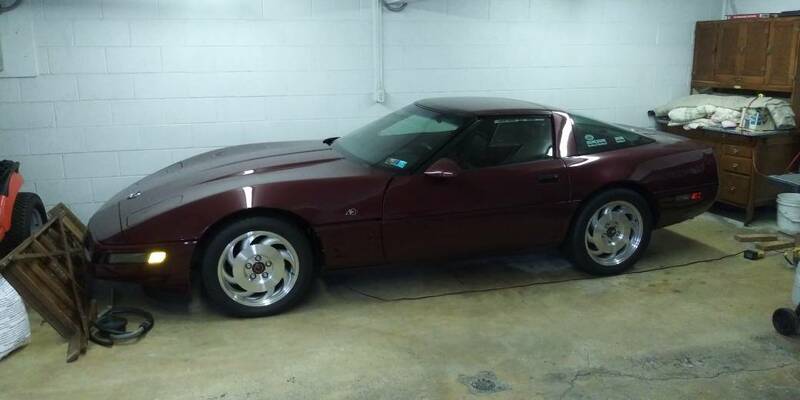 Dad and I had a lot of good road trips in it, every summer to Corvettes at Carlisle, 1999 Corvette caravan to Bowling Green and lots of shows and cruise nights. I'll be doing the same after life calms down, lots to do getting things in order. That's sweet man! Enjoy it and it'll help keep your fond memories of him vivid. haha man that's great. im too scared of bikes and a vette is a great substitute. when i was a kid we had some neighbors two doors down, i think jr officers in the marine corps. one had a Harley and the other a C4 vette. they finally talked enough smack they lined up on the street and drag raced vette vs Harley. i don't need to tell you who won but the vette kept up decently. bowling green! sounds like you already have a good handle on this vette ownership thing! keep it going, pass it down. you are sitting on a hell of an heirloom there. Yeah my Dad has had a Vette since I was about 10 yrs old so I've been into the Vette culture for a while I just didn't have one of my own.